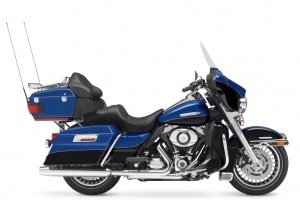 The new king of the Grand American Touring experience, the Electra Glide® Ultra Limited offers enhanced performance and features, with distinctive styling upgrades. The Twin Cam 103 engine that delivers 10 percent more torque than the Twin Cam 96™ engine offered in other Touring models. 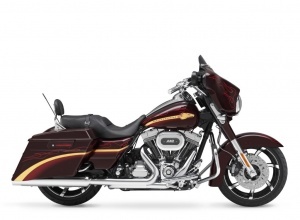 The Street Glide® Trike brings lean, stripped-down, hot-rod styling to the three-wheel category. 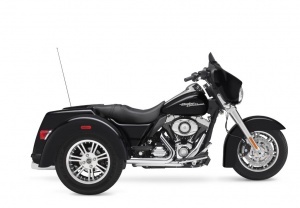 The Harley-Davidson® Trike platform brings original-equipment design, quality and service to the three-wheel motorcycle segment. Trike models utilize a frame and associated chassis structure and geometry engineered specifically to handle the loads generated by the steering forces and weight of a three-wheel vehicle. Darker and lower, the Fat Boy® Lo retains the bold presence of the Fat Boy® while offering a fresh interpretation of the motorcycle that still defines the segment. A re-shaped seat and lowered suspension combine to produce the lowest seat height of any Harley-Davidson® model, just 24.25 inches. 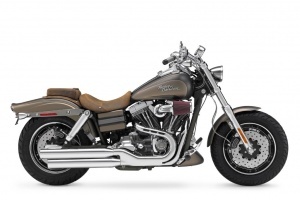 The Softail rear suspension mimics the clean lines of a vintage hardtail frame but offers the comfort of modern suspension that is hidden under the chassis. 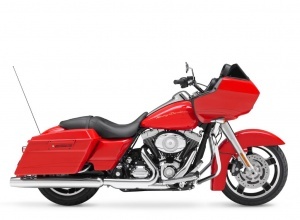 The Road Glide® Custom is a tougher, lower vision of the shark-nose Harley-Davidson classic, with a big 18-inch front wheel, a 2-into-1 exhaust, and a smooth tail light assembly. This bagger rolls with new swagger. The Harley-Davidson® CVO™ Fat Bob® is a limited-production custom motorcycle that projects an agressive, super-duty presence behind a beefy front wheel, twisted Tommy Gun exhaust, bold paint and innovative custom styling. The CVO Fat Bob is based on the Harley-Davidson Dyna platform, which pairs Big Twin performance with an extended FX front end, exposed twin rear shock absorbers, and an under-seat battery box. 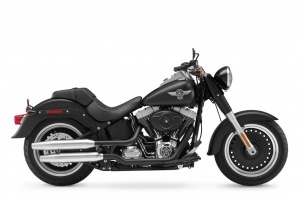 The new Wide Glide® is a Dyna® Big Twin done up old-school chopper style - a low, stretched-out custom with drag bars and forward foot controls that give its rider a real fists-in-the-wind profile. 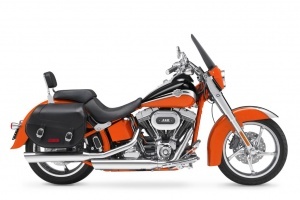 The LED stop/turn/tail light combo and side-mounted license plate keep the chopped rear fender clean. The Harley-Davidson Dyna family has its roots in the factory-custom revolution of the 1970s, and combines Big Twin performance with an extended FX front end. 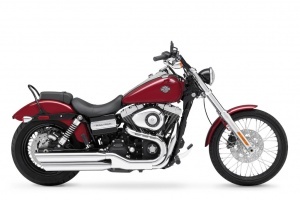 Dyna models deliver great handling and bold styling. Full-size photos in the 2010 H-D Model Photo Gallery. MILWAUKEE (July 25, 2009) - Harley-Davidson roars into 2010 with nine new motorcycle models, the most expansive new-product introduction in the history of the Motor Company. Across six model platforms, Harley-Davidson achieves a fusion of tradition and technology in a motorcycle product line that offers more power, luxury, and style, and more value. "This ambitious new motorcycle launch reaches to our riders with the incredible passion that Harley-Davidson has inspired for more than a century," said Bill Davidson, Harley-Davidson Vice President of Core Customer Marketing. "We are thrilled to offer our customers nine new models and a full selection of products for 2010 that lets their enthusiasm for enjoying great motorcycles continue at full throttle." Photos and other materials courtesy of Harley-Davidson. Photos copyright © 2009 Harley-Davidson. Trademarks are the property of the respective owners. Submitted by Dan (not verified) on January 30, 2010 - 7:39pm. Submitted by Fred (not verified) on March 21, 2010 - 12:00pm. Dan,I beg to differ with you.The baby boomers did not screw up the Moco,the unions did.I am not a boomer (54),and I have an expensive bike in my garage,only in winter if its not in Fla. and I can peel that bike like a bannana.Take apart any part and repair rebuild replace any thing on it Again I must say I blame the unions. Submitted by Anonymous (not verified) on March 8, 2010 - 1:03pm. He's veeerry particular. And verrrry Special. Submitted by Paul (not verified) on April 4, 2010 - 4:59pm. Hello, Fred you are a BOOMER if you were born 1946-1966...I think that it includes yourself...or almost does. Anyway Harley just jacked up the rates like any other company but as Dan says they saw a bunch of people that had some disposable income and the price shot up for everyone.The richer folk that are for the most part(POSERS) screwed it up for the "normal folk", market forces I guess they call it.Big banks in the USA are scruuuuwwed .The unions may have added a bit to the price but not a lot compared to the greedy corporate . Watch for Chinese chop choppers comin' yer way. Ride on brothers!!!! !